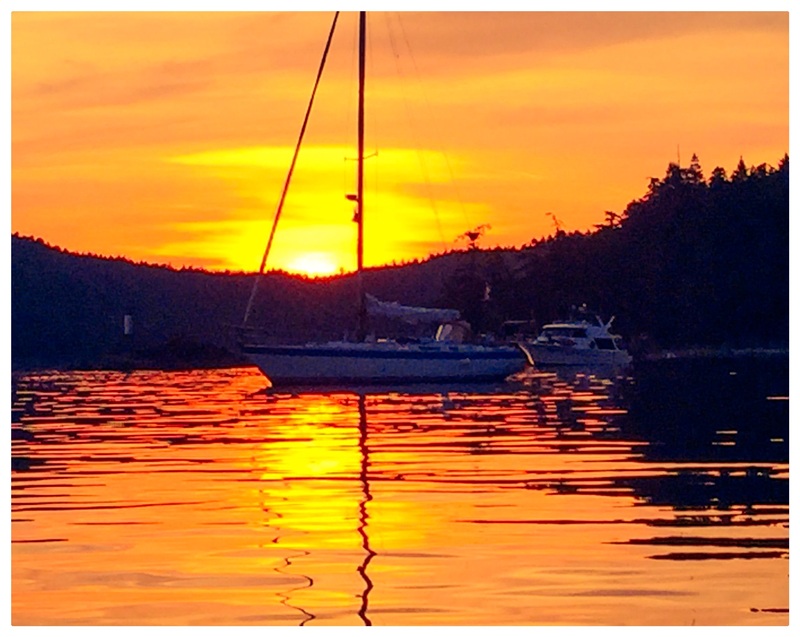 When you enter Canada by boat in the Gulf Islands, there are a few places you can clear customs. We chose Bedwell Harbor on South Pender Island. When you enter the serene bay, the first thing you can make it out is a very large, gray, ominous looking ship anchored about an eighth of a mile in, tucked in a little to the NW, silently filling the bay with its presence. I peered through the binoculars (like Mrs. Kravitz I am on the boat), trying to make it out. Is it military? Commercial? Neither. It was a customs boat. “It’s a CUSTOMS boat,” I whisper-yelled in that way you do when you perceive, for no good reason, that a perfectly benign situation is serious. Maybe even dangerous. “Are you sure?” Loren asked me. “That looks like a fishing boat.” “It’s a big gray official boat with a huge red maple leaf on the side. It’s Customs.” I was very definitive. I immediately proceeded to the gallery to gather all of the citrus that the officials would surely be coming to seize. When they boarded our boat and searched us and then held us on account of my insanely whackadoodle passport situation (another time). And we would have to turn around and go back home. We would be kicked out of Canada. Probably arrested. Held for who knows how long. We’ve all seen Midnight Expeess. Here’s how it actually went down. We pulled up to the customs dock, tied off, and Loren went up to the “hut.” (Only the captain is allowed to disembark the vessel!) He picked up the “customs” phone, gave our boat info (registration number), our personal info (passport numbers), declared we had some booze on board, said we’d throw away our eggs, and was back in five minutes. We then headed into the bay, threw out the hook, and tendered back into the pub for dinner. No search. No seizure. Just this.